Imagine this: it’s a beautiful, warm summer day. You’re in the backyard, drinking a glass of iced tea, and listening the wind chimes. A few feet away, your morning laundry is hanging up to dry in the sunshine, dancing in the wind. And once it’s dry, you know it will smell warm and fabulous from being outside all day. I don’t know about you, but to me, line drying takes me back to a simpler time. It’s the embodiment of summertime, and I love the way clothes feel after they’ve been drying in the sun. Line drying used to be a common practice in this country. After all, it’s what everyone had to do before the first clothes dryer was invented in 1935. But, line drying has fallen out of favor the past few decades. These days, there’s a lot of negative stigma attached to line drying. People, especially in planned communities, feel that line drying lowers property values and makes the community look “unsightly”. According to the Wall Street Journal, more than 60 million people live in over 300,000 “planned communities”. And, most of them completely ban line drying. The good news is that thanks to growing awareness and a trend towards frugality, line drying is gaining momentum again. And with good reason. 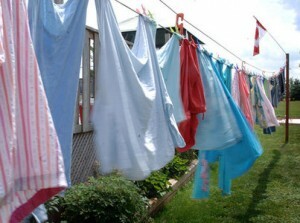 According to LaundryList.org, people who regularly line dry can save $25 off their monthly electric bill. And, clothes that are line dried last longer because they’re not regularly subjected to the intense heat of an electric dryer. So, line drying clothes is a great way to go green and save money. Ok, so line drying clothes isn’t rocket science. But, there are some tips that will help you get better results and save you some frustration. Buy a good line- Cheaper lines are going to sag with that heavy laundry over time. So, buy a sturdy, thicker line, and tie it as tight as you can. Don’t hang your line under a tree- Birds. Enough said. Fold your sheets- Sheets are big, and quite heavy when they’re wet. If you’re not careful, they’ll drag to the ground and get dirty again. So, fold them in half before pinning them to the line. Careful with your shirts- LaundryList.org says that if you’re not careful, button up shirts will have bunched shoulders from the clothespins once they come off the line. To prevent this, hang shirts by the hemline instead. Hang your dresses on a hanger first- If you want your dress to hold its shape, hang it on a hanger first, then attach the hanger to the line using a clothespin. Keep an eye on the weather- With summer comes thunderstorms. Make sure you’ve seen what the weather is going to do that day before you hang out all your laundry. Maximize space- If you’ve got a very small area to work with, don’t forget you can hang two lines on the same posts. One is high (this can be used for sheets, towels, and jeans), and the other is lower down, by your waist (which can hold small t-shirts, shorts, underwear, and socks). Don’t fold socks- If you fold socks over the line to save pins they’ll dry slower, and might fall off if a good wind comes through. Always pin them from the toes. Watch the time- It’s hard to say how long your laundry will take to dry because so much depends on outdoor temps and humidity levels. Tammy, a blogger in Seattle, has a great article on line drying; she says in the hot summer her clothes take less than two hours to dry. On a cooler, cloudy day, clothes could take 8 hours. Definitely go check out her article; it’s got a lot of wonderful information. Just because you don’t have a backyard doesn’t mean you can’t line dry your clothes. There are tons of indoor drying racks that will allow you to air dry clothes in your bathroom or by the heating vent. Plus, you’ll get the added benefit of the humidity from the wet clothes in the wintertime. You’ve got to plan ahead with indoor drying. During the winter months, clothes can take 6-24 hours to dry indoors. If you happen to live in a planned community where line drying is banned, then finding a way around it might be tough, especially if your neighbors are the persnickety type. In this article from the Wall Street Journal, some people have gone to extreme measures to line dry their clothes. One woman had her clothesline out in the backyard, fought her months with the community planning board (which threatened legal action if she didn’t take her clothesline down), and is now line drying her clothes in the garage with the door half way open. She’s thinking of moving. Another woman in Arizona dries her clothes on a line under her deck, out of sight from the neighbors. Most of the time, complaints come directly from neighbors, who simply don’t want to look at someone else’s undies flapping in the wind. So if you can find a way to hide your line from view either with trees, tall shrubs, or a screen, then you might be ok. If you’re rankled about the fact that you can’t line dry in your community, then talk with your local Homeowner’s Association. If you make the case for line drying, and explain how much money and energy and it can save homeowners, they might rescind the ban (especially if you get a petition going from your neighborhood). Change can only happen if people are aware of the benefits! For the mother-lode of air-drying information, check out this amazing article from Tip The Planet. It really has everything you’ve ever wanted to know about air drying your clothes, and all the products that are available to do it. Another great resources is LaundryList.org. They’re a non-profit whose goal is to raise awareness on line drying, and how much it can help the planet. They believe that everyone should have a legal right to hang out their laundry, so if you’re interested in taking action in your community these are the people to talk to. Where I live now, if I line dry, my clothes end up stiff as can be. This wasn’t the case when I lived in Oregon. Maybe there is something in the water here. Great post…I love line drying my clothes. But I have to add a counterpoint when you say line-dried clothes last longer. Dryer heat can be damaging, but so can the sun. Especially if you live closer to the equator (or in the summer months when the sun is more direct), the sun can fade your clothes quite quickly. Some tips to reduce fading by the sun: turn your clothes inside-out to preserve the color on the outside, and try to take them down as soon as they are good and dry. Wow, that’s a great point. Those tips are excellent; thanks so much for writing in and sharing them! Line-drying is one of those things I wish I could do more often, it’s impossible to do a whole load in my tiny apartment. I love visiting my family in Japan in the summer time – we don’t even have a dryer! It’s so eco-friendly and I love that my clothes don’t shrink! The sad things is, all my clothes I buy in Japan are not made to withstand dryer heat (because so few people in Japan use dryers) so all my clothes shrink when I come back to the U.S.! Do you have a link for the drying rack? It is a lot like the one I used when I was in Slovakia, but I haven’t been able to find one in the US. BTW, I live in Chicago and my roommate and I only have a washer, no dryer. I dry all my clothes and linens on drying racks, although recently my roommate installed some lines in our back porch near the ceiling to more easily dry linens. Because I load the racks VERY full, it usually takes 2 days to dry everything, but it is much better for my clothes and for my sanity. Just say no to laundromats! That drying rack is a model that’s sold at Sears.com. I use one that’s almost identical and love it! This Line Drying Guide is exactly the type of info that my fellow Greenwala members and I have been craving, so I’m going to post a link to your article on our green wall right now. Also, I like your style and think that you’d add a lot to our community by joining and sharing your voice. Basically, Greenwala is an online community for eager greenies (and everyone inbetween) who want to exchange ideas, expand their knowledge base on all things green and interact with equally motivated eco-stewards. Plus, a tree will be planted when you sign up, so please step on board and spread the word!! I found this article on http://www.greenwala.com. I’ve been line drying and rack drying for 18 months now and I can not even begin to tell you the difference in our electric bill! Not to mention the environmental impact. I always helped my mom line dry as a child but with college and life I gave up. Recently when I started again at my mother’s behest, it seemed a bit awkward but now I organize the clothes as I place them so that I am able to come back quickly when then are dry and fold into each person’s pile. I don’t think I can go back to the dryer! I use it for storage now! These are some great tips! I do not think line drying lowers the value of a property at all. I will always line dry my clothes. If the weather’s good, it’s so simple and easy and the clothes dry pretty fast! Saves money as well as the environment! You could air dry your clothes indoors throughout the year, even if you think you don’t have space for a drying rack. AirDry does not need any floor space. 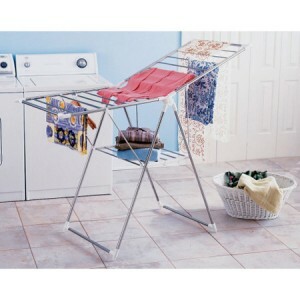 It comprises of six rods that can be individually raised or lowered, and can accommodate a full load of laundry. Imagine how simple it will be to lower the rods and hang your damp laundry right out of the washing machine. Raise each rod and let the warm air trapped near the ceiling finish off the drying. thank-you for reminding us of the economic and environmental benefits of air drying our clothes. My unique wall mount drying racks are designed for indoor use and can accommodate up to 5 QUEEN sized bed sheets! The best part is the drying rack extends from the wall only 3.5″ when not in use so it takes up very little space in the home. The sturdy 1″ diameter drying rods won’t bend and are made of strong Douglas fir. I live in an area with definite four seasons. For three of those seasons, I line dry my clothes. We get lots of sun in our yard and we live at high elevation, so the air is very dry. Our clothes dry in about as much time as it takes to dry them in the dryer! Since we have a long narrow easement for a clothesline, we are going to use an Amish pulley system off our deck, making it easy to hang and retrieve the clothes. I think the best part is that one of the life’s drudgeries is made so much more relaxing, such as hearing birds as you hang your laundry and knowing that your laundry will be fresh smelling and dry when you come from work! Thanks for a great website!